For all of us who really love fashion it's one of the very best times of the year: when all the freshest fashions that are going to be big for the next season are unveiled. I love being able to see what will be coming up ahead, and I consider trend forecasting to be a talent of mine. While it's great to see what new trends are emerging, it also really excites me to be able to find pieces that are timeless. An example this season can be found in a flattering, modern, grey sheath that can be dressed up or down and worn for fall or spring, like this one from Alexander Wang. While I've always believed that you should wear what you love and feel comfortable in, trends are something that undeniably touch each and everyone one of us. Everyone from the fashion obsessed to the bargain shopper that unknowingly may be wearing something that was new for Fall 2011 is touched by trends. There are those that come and go and those that are timeless. There are those that stay for a decade, and then are never seen again. (Everyone has seen The Devil Wears Prada when Miranda schools her new intern on the importance of cerulean blue). Every spring and every fall the fashion world comes together to collaborate and decide what will be fueling our closets for the next year (at least). Besides just new trends, it's always inspiring to see what old trends re-emerge, upcoming/new designers, street styles, and what they do to make the shows inspiring or unique. Polo Ralph Lauren held a 4D stage for models to walk on, while Marc Jacobs had girls in utilitarian looks with black wigs to make them all look like one big army of models. 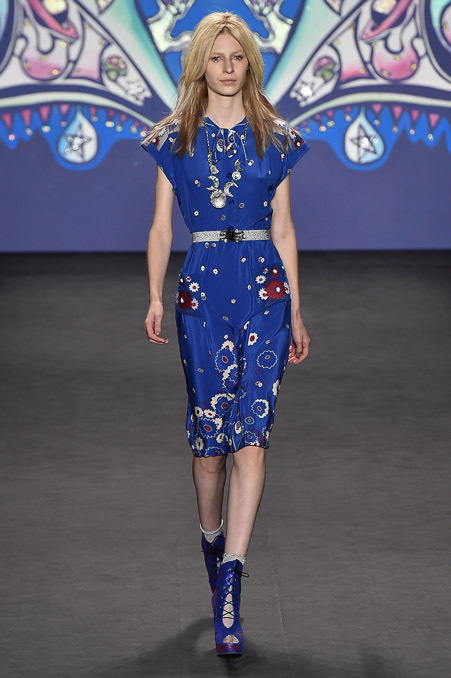 Meanwhile, Jeremy Scott never ceases to shock with his garish colors and off the walls prints and silhouettes. While none of those shows were my favorite, they were all unique and worth mentioning. It's not possible for me to do a thorough analysis or full breakdown of everything I loved or hated from NYFW, so here is just a simple edit of some of my FAVORITE looks from 4 of my FAVORITE shows!! Here they are, enjoy! Oscar De La Renta: This collection screamed "garden party". I love me a good gingham, and it was all over the Oscar De La Renta runway. 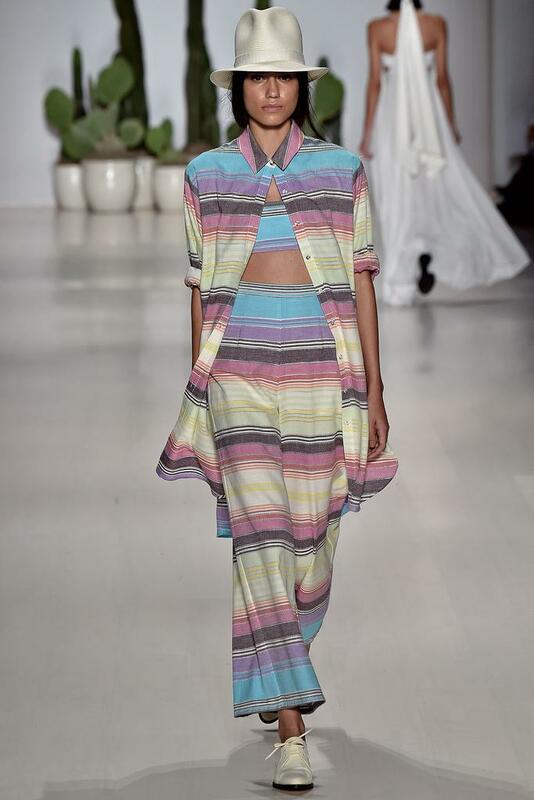 I loved how playful and youthful this collection was. De la Renta really emphasized cropped tops paired with sheer overlay skirting and oxfords for his day looks. 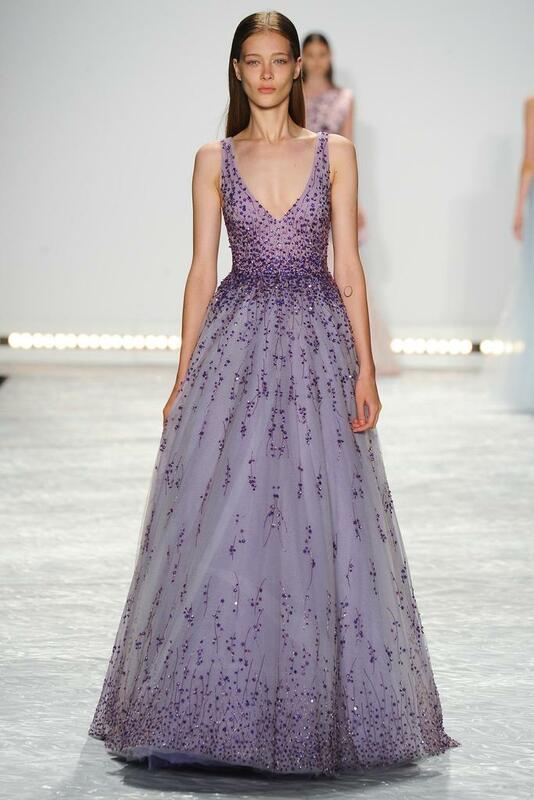 Obviously, the star of the show with De La Renta is always the gowns, and there were many gorgeous ones to be had. Expect to see at least one of these below on the Oscar or Golden Globe carpets come next year. This entire collection was ethereal. 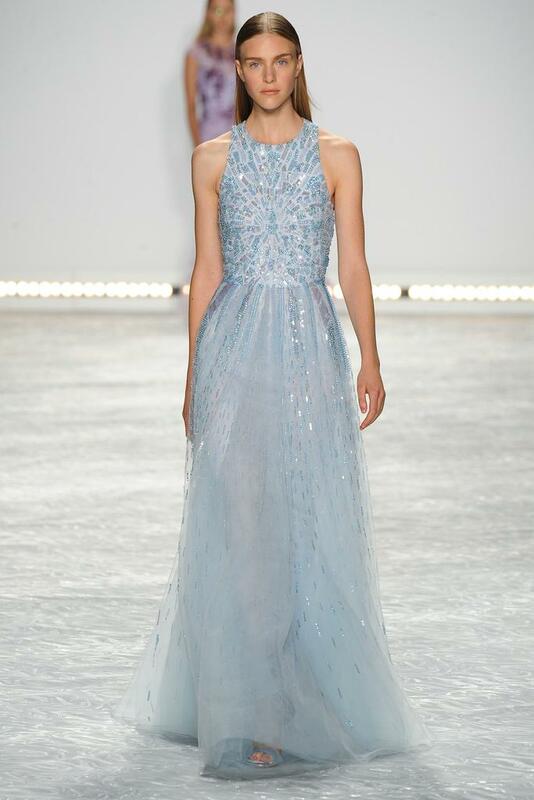 Monique Lhuillier is definitely one of my favorite designers purely because she makes such BEAUTIFUL things. For this collection I was impressed with how well she translated her perfect evening wear designs into similarly tailored day wear looks. Her use of new and innovative fabrics also stuck out. She also notably played with the sheer skirt like we saw at Oscar de la Renta. For evening wear her impeccable use of fabric and draping was a focus, and her ever ladylike silhouettes shone. I'd absolutely love to have an excuse to wear one of her gowns again. Expect to see one of these dresses during the awards show circuits or potentially as bridesmaids dresses for a celebrity wedding. 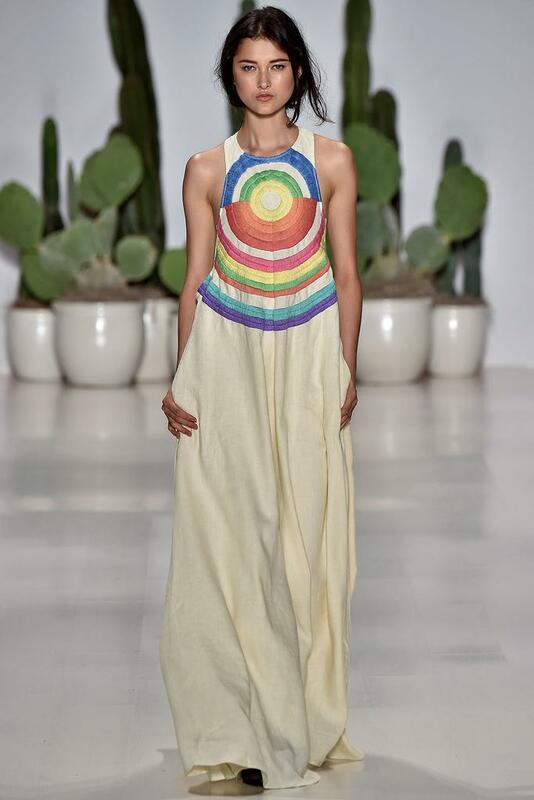 Mara Hoffman is a name that is synonymous with bright, eclectic, patterns with a laid-back resort wear feel. This season Ms. Hoffman decided to opt for a more muted palette with lots of white and soft peach, while still maintaining her signature feel of breezy beach wear. Mara's clothes are always perfect for a beach bum like me, and I find her a go-to when it comes to swimwear and clothes I can live in every Spring/Summer. These clothes can take you anywhere from a weekend in Palm Springs, to poolside in Miami. Since it's so hot in LA right now I wish I had some of this collection right now, considering it's sweltering in anything fall fashion appropriate! 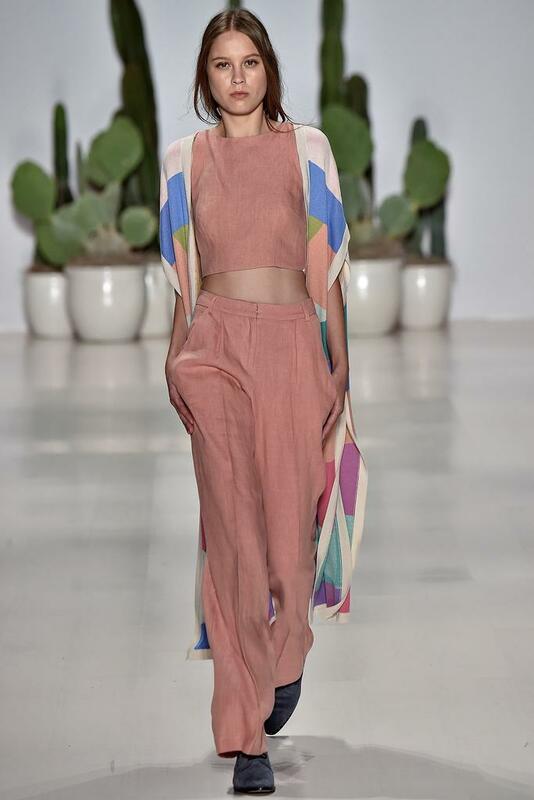 Again with her collection we see lots of cropped tops and well-placed flirty cut outs, a constant in most collections for S/S 15. I pretty much want to wear this entire collection to Coachella next year. 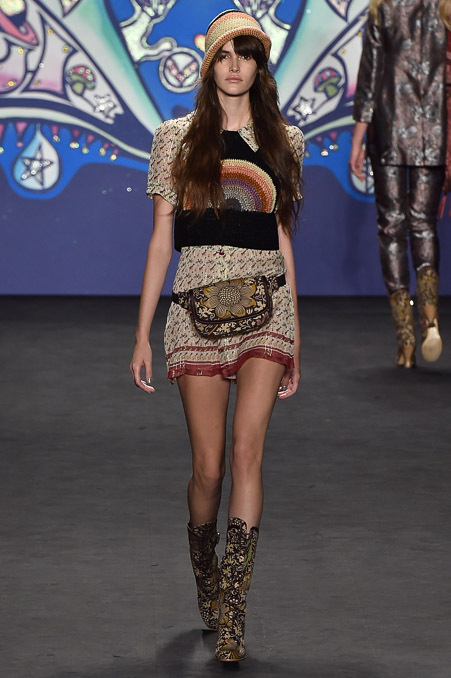 Anna brought some of the most fun, 60's/hippie inspired fashion to the runway for spring 15. I loved her use of well placed cutouts and playful, yet cool-girl layering. The socks/ sandals combo added a touch of whimsy. Her color palate was also punchy and fresh. The red pantsuit is gorgeous, and I'm dying to get my hands on one of those long cream, knit, sweaters! I imagine if Pamela Courson (The Doors' Jim Morrison's late girlfriend) was still alive, she'd be wearing something from this collection come spring.